We have organised an extra natural dyeing and spinning course as our July week is now full. 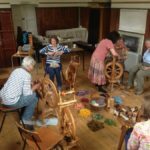 Our extra spinning course will run from August 26th-August 31st. The course will include two days of natural dyeing and two days of Spinning with Alison. The first half of the course is spent foraging for dye plants and making natural dyes outdoor over fires. We use foraged dye plants native to Scotland as well as some ancient imported dyes. We create over 25 shades from about 7 dyes, dyeing fleece ready to spin! The last two days are spent learning to spin with Ali. Alison provides all the spinning wheels, all of which are slightly different, giving everyone a chance to try different types of wheel. 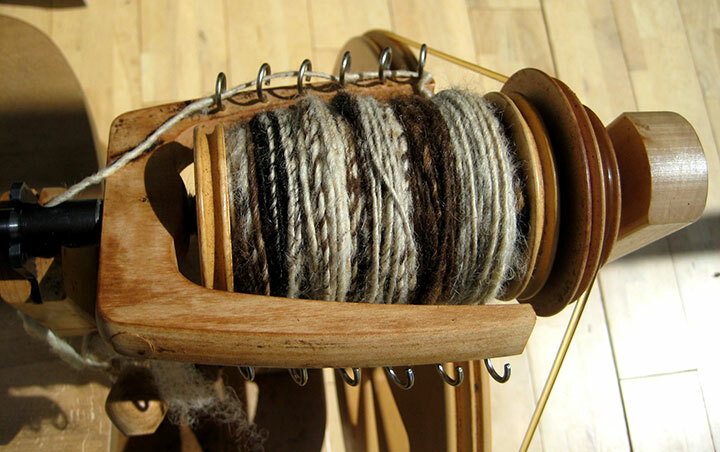 Over the two days participants learn to spin their own yarn from fleece they have naturally dyed. Guests stay at the Old Stables, which is a beautifully converted barn, with modern luxuries set amongst woodland and farmland. We provide all the meals and pick all our guests up from Inverness. Inverness is easily reached by plane or train, overseas travellers can make connections from London, Edinburgh and Glasgow.